This past Sunday, Ivana and I drove down to Venice's Abbot Kinney Blvd for an afternoon-tea-for-lunch adventure. Our destination was Jin Patisserie, which looked charming based on its website and is also very popular on Yelp. The patisserie is set a bit back from the street, and the main gate (more of a door) opens onto a small courtyard with tables. It was drizzling quite steadily when we arrived, and there is in fact no indoor seating, but we got quite lucky in that the staff immediately offered to set us up inside - it turns out that there is just enough floor space inside the shop for a two-top. The only other guests were five or so women having a merry bachelorette party on the porch. First, the tea selection. Jin Patisserie serves and sells teas from the French company The O Dor. Ivana decided on Pu-erh and I chose a milk oolong, which is either an oolong tea that naturally has flavors of sweetness and creaminess, or has been flavored to a similar end result. Given that The O Dor is supposed to be awesome, I'm hoping this milk oolong was the former, naturally-flavored type, but either way it was fragrant, smooth-tasting, and had a pleasant finish without any artificial aftertaste. 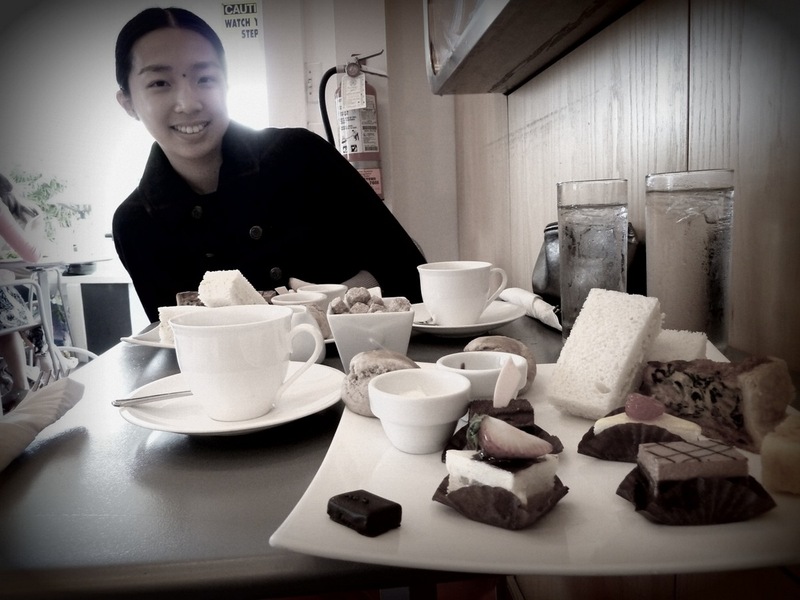 Ivana enjoyed the rich smokiness of her pu-erh, as well. The plates of savories and sweets were set down a bit later. Each person's plate had two scones (served with clotted cream and jam), two egg salad sandwiches, a slice of spinach mushroom quiche, four little cakes (two chocolate-based and two fruit-based), a small piece of butter cake, and a little chocolate. The scones and quiche were served warm, which was a nice touch. I thought the scones were on the dry side, but still tasty, and the quiche was very tender and flavorful. The egg salad sandwiches were simple, but contributed to the plate's savory side, and all of the cakes were delicious. Our chocolates were herbal ganaches - I think a peppery flavor - with dark chocolate shells. We thought this afternoon tea was wonderful! Each person's tea set - including a small pot of tea, which provided three cups, and the sweets/savories shown - was $19. (Note that Jin Patisserie does not include free refills of hot water). The quality of both the tea and the snacks, plus the patisserie's pretty atmosphere, made it a place that we'd happily return to.